Reacting to the news of Palisades' plans for their X-Files PALz, we wrote an open letter detailing why blind packaging is a bad idea, intened only to screw over dedicated fans. Well, just as the Star Wars Lego Minis prove that not all clamshells are bad packaging, Marvel's new Figure Factory series proves that blind packing can work - but only if you do it smart. 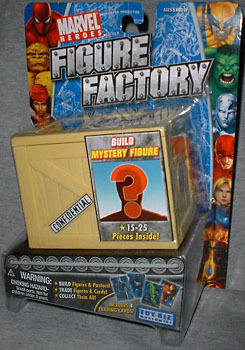 Figure Factory is one of two new lines from the folks at ToyBiz. While the other, Super Hero Showdown, is an action figure game in the tradition of Shadowrun: Duels, Figure Factory takes a cue from Gentle Giant's Bust-Ups: inside the packaging is a small, ready-to-assemble statuette of a Marvel character. The packaging for these figures is really striking; though, depending on your tastes, it might be a bit too busy. 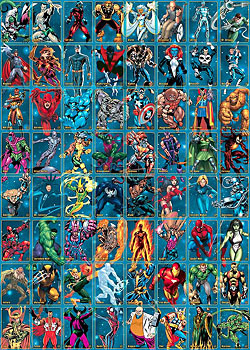 Twelve headshots of Marvel characters run down the side edges of the card, and the center resembles a blueprint. The blister on this cardback houses a plastic box designed to look like a wooden crate. The box rests in the blister on an angle, thanks to the inclusion of a quadrilateral trapezoid designed to look like a conveyor belt viewed from the side - altogether, they're really working the "Factory" part of the line's name. You'd think that since all you can see in the blister is a plain box, this line is blind-packed. Well, you'd be partially correct. Series 1 of the Figure Factory line comprises 20 figures: eight identified figures and 12 mystery sets. The identified figures are shown on the back of the card, and clearly labeled on the front of the blister - even their crate has an identifying insignia on the side. That is what makes the "semi-blind" packaging of the Figure Factory sets better than the truly blind X-Files PALz. If you want a main character, the packaging tells you who you're getting. The casual fans can find the recognizable folks they want, while dedicated fanboys can be sure that there are at least eight figures they won't have to buy two of. The 12 mystery sets are a mix of new characters and variants of the identified figures. You'll notice there's no J because, just like the 18th century alphabet, it's too similar to I to worry about. The crate measures 3 1/2" wide and is 2 1/2" square in the other dimensions. It's detailed nicely with a faux wood grain, painted with a few logos - Marvel Heroes, Figure Factory and Confidential - and has a sticker on the side hinting at the contents. The lid is removable, and the figure is bagged inside. Well, that's not entirely accurate - the pieces of the set are bagged inside. Each Figure Factory set is built from 15-25 pieces that all fit together without glue or other adhesives - the pieces just have specifically shaped pegs to hold them together. The figures are, more or less, in a 3" scale, though their large diorama bases can push the assembled pieces much higher. Included in the crate is a sheet of vague instructions to almost quite nearly assist you in putting your new statue together. Behind the crate in the blister is a pack of four double-sided collectors' cards. The images on the front depict a single Marvel character, while the sticker on the back is part of a larger Spider-Man image. There are 64 cards in the series, and if you collect them all, you can assemble both sides into separate poster-sized images. The fact that ToyBiz made the second image a removable sticker shows that they were actually thinking of their fans, rather than trying to screw them out of more money, like some companies we could name. In our Open Letter to Palisades, we tried to figure out a way to deal with blind packaging that didn't completely screw over the fans. We didn't come up with anything good, but ToyBiz found a way: the Figure Factory sets mix blind packaging and chase figures with prominent identifying information on the most popular characters. The mystery figures and trading cards create a bit of fun collectability. The sets retail for about $6, and they look pretty good once they're assembled. In short, they're affordable, fun, and well-designed, exactly what we expect from ToyBiz.